high, particularly in view of the need for two professional pilots; but it is still difficult to find an aircraft which, for an initial outlay of a little over $363,000 (about £129,500), will carry five people in extreme comfort and safety at over 300 m.p.h. for about 1,800 n.m. The particular aircraft at Gatwick, registered N300V, was owned by Mr Daniel G. Van Clief, an American blood-stock dealer, and was being offered for sale at a mere $190,000 (about £68,000). Make no mistake about it, the Marksman is an airliner, and even better equipped than most. 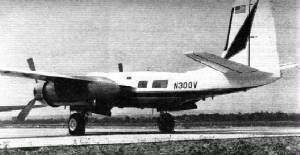 Having procured an ex-USAF Douglas B-26 Invader airframe, On Mark proceed to introduce the following modifications: fuselage and wing-spar conversion, involving the fitting of a ring spar in place of the straight-through rear spar; fitting of windows and hydraulically operated air stairs; a sumptuous fiveseat interior with bar and toilet; 165 US gal tip-tanks fitted with landing lights; straight-in filler necks allowing a further 70 US gal in the existing wing tanks; 103in-long plastics nose with room for full-size weather radar and 1,0001b of baggage (with separate access hatch); dual controls, very comfortable pilots' seats, athwartships jump-seat for third crew member or sixth passenger, "custom" instrument panel; 100,000 BThU combustion heater; Scott oxygen system; DC-6 wheels and brakes, anti-skid braking system, steerable nosewheel and chromium-plated undercarriage legs; de-icer boots on wings and tail; all-metal rudder of extended chord with servo and trim tabs; new canopy panels with tinted double glass; refrigerated air-conditioning system for use on the ground and in the air; petrol-engined 105A a.p.u. in tail of starboard nacelle: special paint scheme; 20gal alcohol system for windscreen, propeller and carburetter de-icing; fire warning and extinguishing system; Bendix RDR.1B weather radar; P & W R-2800-CB-16/17 engines giving 2,500 h.p. each with water methanol injection, twospeed supercharger, automatic mixture control and reverse-pitch propeller; Sperry ignition analyser; Sperry A-12 autopilot with heading and height locks, beam capture and hold and ILS coupling; secondary radar transponder; and several other smaller items. In N300V, full duplicated blind-flying instruments were electrically driven on the left and air-driven on the right, with two gyromagnetic compass systems and two RMIs. There were also two VHF com, two VOR/ILS, markers, two ADFs, two completely separate audio systems and two overhead loudspeakers with individual volume controls. The RMIs could be switched to present bearings from any pair of the four aids tuned. All this may sound unnecessarily elaborate, but I found that I used the audio and RMI side of things considerably while boxing myself into uncontrolled airspace along the Sussex coast with the aircraft moving around at anything up to 270kt. At such a speed one should be going somewhere, rather than hanging around. There was only one significant modification which had not been incorporated in Mr Van Clief's Marksman, namely, additional tankage for 200 more US gal. Empty weight, including residual fuel and oil, was 24,2721b; landing weight was 31,0001b and gross weight 35,0001b. Tip-tank fuel could be jettisoned to help rapid reduction to landing weight in an emergency. Otherwise, loading presented no problems because it was virtually impossible to exceed load or e.g. limitations. Even five passengers at 8351b, two pilots at 3301b, a jump-seat occupant at 1651b, 1,0001b of baggage and the full 1,130 US gal fuel at 6,7801b only brought the gross weight to 33,3821b, leaving more than 1,6001b in hand. Thus there was ample weight allowance for the final 200gal and even more equipment. There was no formal flight manual for the aircraft and Capt Neale flew at very conservative power settings. These were the answers he used for flight-planning: he cruised at 1,100 h.p. per engine, which he could maintain in low blower up to 14,000ft or in high blower up to 21,000ft. This gave a TAS of 270kt and fuel consumption of 174 US gal/hr. The climb was made at 1,200 h.p. per engine at 180kt i.a.s., covering 130 n.m. in 40min to reach 4,000ft, the favoured cruising height. Extreme range and endurance to dry tanks was then 1,660 n.m. and 6.25hr. Use of 1,200 h.p. per engine for the cruise would give a TAS of 280kt and an extreme range of 1,530 n.m. The rather sketchy handbook gave VNE as 310kt, maximum undercarriage-down speed as 139kt—this last being much too low for comfortable flying. Speed for up to 25° of flap was 217kt. Clean and dirty stalling speeds were respectively 97kt and 84kt—rather high by modern standards. The VMC on one engine was lllkt and the best single-engined Fate of climb speed 144kt. Although a larger rudder, vortex generators on the fin and a servo tab had brought VMC to a reasonable level, the original military B-26 had a VMC of no less#than 130kt and single-engined climb-out after engine failure was not recommended. Military crews were instructed to land straight ahead if an engine failed immediately after take-off. The stalling speeds are also much higher than would be achieved in a modern design of the same gross weight. The Hawker Siddeley 748, for instance, can be flown down to 65kt without any difficulty and remains very manoeuvrable at 80kt. Capt Neale, his co-pilot John Fink and I had climbed up the air stairs and settled in the passenger cabin while we looked out these figures, and we now crawled through the shallow tunnel beneath the main spar to reach the flight deck. Capt Neale took the left seat, I the right and Fink the jump-seat. From the serried ranks of instruments I managed to pick out my set of blind-flying dials and we spent some minutes with a.p.u. running to sort out the radio and audio systems to our satisfaction. Then Capt Neale cranked over the big propellers one after the other and set the engines to their rumbling idle power. We had earlier spent some time walking about on the top of the fuselage and wing, so we now closed down the two overhead hatches and set the cooling blower going. Because of some trouble with one of the water methanol pumps, we intended to use only dry power of 1,950 h.p. each side. Capt Neale also used 100-Oct fuel, which reduced total "wet" power from 2,500 to 2,400 h.p. per engine. Neale and Fink ran through a comprehensive list of checks to bring the Marksman to take-off readiness. They checked magnetos, autofeather, electrics, oil cooler shutters in "auto," cowl gills closed, radios tuned (this was a lengthy process), autopilot disengaged, three trimmers all neutral, fuel tanks selected and boost pumps on, carburetter air cold, superchargers in low gear, water methanol system armed, a.p.u. switched-off at the last moment and several other items. For take-off the throttles are opened wide before brake release. water methanon would have given a very useful, but not vital, extra 1,000 h.p. ; but acceleration without water was pretty hot nevertheless and control on the ground no trouble. The VMC of 111kt is taken as the Vs speed and rotation from a firmly nose-down condition was begun at lOOkt. With a fair pull back, the Marksman unstuck smoothly and accelerated so rapidly that the gear and 15° of flap could be cleaned-up immediately and throttles pulled straight back past METO to climb power. By the time this was done, speed had increased beyond the single-engined best climb of 144kt and we were free to climb at about 150kt and over 2,000ft/min or 180kt and l,200ft/min. The big engines had been noisily clattering outside the windows during take-off, but settled to the rough rumble typical of a DC-6 in the climb. I had before me, in addition to a full set of flight instruments with air-driven gyros, an RMI on which I could select No 1 VOR or ADF and No 2 VOR or ADF. We had London and Seaford VORs and Mayfield and Gatwick GE locater tuned, so navigation was no problem. I headed to the south coast at Shoreham and climbed up amongst and over layered cloud along the south coast between Brighton and Selsey Bill. powerful rudder at around 200kt. Induced yaw caused immediate roll response and the yaw oscillation on releasing rudder took some cycles to die down. Little rudder was needed to coordinate turns. Once trimmed, the aircraft flew itself extremely steadily, though some effort was needed to hold the nose up in a 40° bank. At 5,000ft I settled into a normal 1,100 h.p. per engine cruise, with 2,100 r.p.m. and 33in, and i.a.s. built up to 220kt. Click centreing of the aileron wheel considerably assisted hands-off flight. was very pleasant to fly and a superb IFR platform. I would query the quality of directional stability, the poorest of the three axes. We were certainly covering our patch of coast fast and, because a rate one turn called for some 30° of bank at this speed, a 180° turn tended to take a good deal of time. After a short "feeling out" period I proposed making clean and dirty stalls, but Neale replied that we required 7,000ft for safety, because the aircraft had decided stall characteristics. After some discussion I settled for a deceleration to a "fully dirty" flirtation with near-stalling speed at 7,000ft. Perhaps it was a bit hard to be skittish with an aircraft of this aerodynamic vintage and warlike persuasion. Initial speed reduction brought pleasantly light trim changes which could be accurately cancelled with the low-geared but precise elevator trimmer. When I selected 15° flap with the electric switch at 210kt, trim change was slightly nose-up. There followed an interval while the speed was coaxed back to the maximum gear-down mark of 139kt—rather too low for comfort on the approach. Gear selection led to a protracted sequence of thumps and roars, accompanied by aerodynamic rumblings and a whole succession of different draughts around the feet. Total trim change was nose-down and again almost negligible. boost was now required to fly level and a fair push of rudder was needed to hold the torque reaction, although I had carefully paired the throttles to remove any inducement to spin. The angle of attack had noticeably increased between 110kt and 90kt. Application of a considerable amount of power started the a.s.i. winding up, but produced surprisingly little trim change. After I had reached a safe 100kt, Neale selected flaps and gear up together and we were soon cleaned-up with 130kt and back in the real flying business. I had to take a good long wind at elevator trim. I now proposed that we try singie-engined handling by reducing power on one side to a setting giving drag equivalent to a feathered propeller, leaving the engine ready for immediate urge if the need arose. But Neale offered to feather properly and duly cut the right engine at 160kt. We were at lowish power, so the yaw was not pronounced. The big propeller looked mighty impressive when stopped. Rudder trim was applied by a small winding handle on the shelf between the seats, and I was very surprised to find how highgeared and precise it was. Half a turn relieved all foot loads at this stage. The reserve of power was quite surprising. At cruising settings, one engine will pull the Marksman along at a cool 190kt and only 26in and 2,200 r.p.m. kept us in level flight at above 7,000ft. To reduce speed I climbed to 8,000ft and Neale steadily increased power until, at 130kt, we had the maximum available 1,700 h.p. at 2,400 r.p.m. and 40in. I pulled speed back to lllkt, the VMC, and found that I had all but a fraction of rudder travel applied. Full trim was just cancelling out all foot loads and I was having to use a little aileron to hold the wings level or slightly banked into the good engine. I imagined that the full wet power at sea level would take a great deal more holding at VMC, but Neale said he had tried it successfully on several occasions. Having got this far, I let the nose down to increase speed while Neale and Fink set about unleashing the second engine. It took some manipulation to get it all warmed-up and worked into harness, during which time I wove my arm between four others to readjust the trimmers as power returned. We now called Gatwick and began homing to Mayfield while I set about losing height to below-airways level—a difficult problem until I was told to descend at 240kt. Nothing else seemed to work. From 3,000ft I was told to apply 15° of flap at 200kt and that dragged off the final 1,000ft to the required 2,000ft. While we were all discussing, tuning, setting altimeters, making approach checks and generally doing aeronautical housework, the On Mark's hands-off characteristics came in pretty handy. At 240kt, vertical movements happen quickly enough and a weather eye on the altimeter would be vital in anything less stable. An autopilot, too, can be very helpful in these circumstances. I apologize to the pilot on instrument-rating practice who was told to make another holding pattern over Mayfield while radar brought us straight up to the ILS centreline at six miles. The 1LS needles began to centre and I worked the Marksman round on to the localizer, dropping the gear and increasing to 20° of flap at the same time. During the approach at 130kt the aircraft remained both extremely steady and very responsive to aileron, although the speed very easily slipped past the gear-down limit. I always envy the airline men their rock-like aircraft and three-armed co-pilots. At such a speed, too, the ILS is fairly quickly completed, and drift angles are proportionately small. An ILS at 70kt in bumpy weather rather over-prolongs the agony. At the middle marker, as I was just getting my eyes above the coaming, Neale took over. He made a very smooth touch-down, followed by reverse pitch and braking, leaving the runway at the first high-speed turn-off. The roof hatches were swung open and I was told to taxi, taking care not to over-control. Since nosewheel steering had practically no feel and a delayed response, the aircraft could be wound up into a sharp turn unexpectedly. Regular stabs of toe-brake were also needed to keep speed within reason without throttling the engines back into plug-oiling r.p.m. range. Back at the take-off point we went through the lengthy checks again and I was told to make a dry take-off, holding the nose down until 100kt and then working to get the aircraft off at lllkt. This duly happened without difficulty, the llkt lead being just long enough to achieve rotation. Once airborne, and with a not unrestricted view over the long nose, I held the Marksman level carefully. The a.s.i. progressed rapidly round the dial and the arms interwove once again as Neale and Fink together accomplished all the cleaning-up and power setting. Hardly had we settled into the climb at 150kt and 2,000ft/min than we were instructed to turn left on to the downwind leg, where a mere 2,400 r.p.m. and 28in sufficed to hold 130kt with gear and 25° of flap extended. This approach was a repetition of the first except that I rather overshot the ILS localizer while joining it only about four miles from the runway. I bled the speed off to 110kt and held the aircraft low over the threshold. Once on the runway, you have to make up your mind to stop the Marksman and concentrate on doing so. I was a bit slow, did not have full flap extended, closed the throttles rather late, floated a long way, dropped it a bit firmly on to th^ mam wheels, was not given reverse thrust or anti-skid braking and ended up using the entire length of Gatwick runway getting down to taxying speed. Neale had not applied full flap because I had crossed the threshold rather low. Without the considerable extra drag, the aircraft floated a long way, especially with the trickle of power I inadvertently left applied. A little practice would have fixed this easily, but I now understand why the Marksman likes to have 1,400yd of concrete from which to operate. Altogether I thoroughly enjoyed the aircraft. It is very agile and fast, remains precisely manoeuvrable and responsive down to its rather high minimum speeds and has the equipment and stability of a full-sized airliner. But it must be admitted that nowadays the same gross weight can be pushed along at comparable speeds with much lower approach, stalling and singie-engined safety speeds. This is the inevitable result of more than a decade of progress in design. There is a wide choice of five-passenger business aircraft but few will romp along at 270kt for 1,600 n.m., with such a low first cost. The Marksman may not be as docile as the latest thing in executive transports, but it still offers unusual performance at a proportionately reasonable initial cost. Personally I hope to see at least some of these handsome aircraft in business for a long time to come.